Business View Magazine interviews representatives of ReedTMS Logistics for our focus on Top Supply Chain and Logistics Companies in America. ReedTMS Logistics is a family-owned and operated third-party logistics provider (3PL) that has earned a fine reputation over its 20-plus years in business. The firm provides brokerage, produce transportation, asset-based services, freight management, and dedicated services, all delivered with a 24/7 support network. Each year, ReedTMS manages over 85,000 shipments for more than 600 customers from a variety of industries using multiple transportation modes. No matter what you’re shipping, they have you covered. Internally, the company is focused on creating an outstanding environment where its people can grow, develop and, in turn, deliver on the expectations of customers. Reed Transport is the non-asset-based operation of ReedTMS Logistics, offering brokerage, produce transportation, and freight management services throughout North America by leveraging a network of over 27,000 active motor carriers. TMS Logistics is the asset-based operation of the company, offering dry van, refrigerated, blanket wrap, and dedicated/private fleet services delivering superior, on-time performance through a strong team, quality equipment, and effective use of technology. Business View Magazine asked ReedTMS Logistics CEO, Jason Reed, Chief Sales Officer, Jordan Strawn, and National Sales Manager, Matt Castriotta for insights into their company’s strengths, challenges, and plans for future growth in the ever-changing trucking and logistics industry. The following is an edited transcript of that conversation. 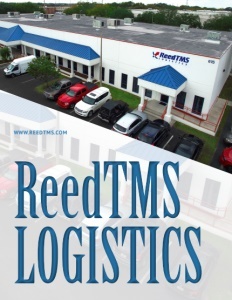 BVM: Can you tell us about the formation of ReedTMS Logistics and its evolution? Reed: “My father founded ReedTMS in 1996 and I was the first employee. He basically started the business to work for himself. He’d been in transportation his whole life, more on the air freight and LTL sides. Then, he got an opportunity to get into truckload brokerage – he was kind of a pioneer and pretty much figured it out on his own, but he needed a partner in crime, so he hired me. From his background in air freight, he converted a lot of those customers from air to expedited ground. Fast forward to 2005; we’d become a viable company with 25 employees. My dad retired, we hired my brother (our current President), and we started in to invest in infrastructure, employees, technology, and went into growth mode, reinvesting a lot of our earnings back into the business. In 2017, we closed the year out with $150 million in revenue and we’re continuing to grow. In 2018, we’ll be up another 40 percent on top of that. BVM: How do you differentiate yourself from the competition? Reed: “We’re not just a 3PL, not just a motor carrier, we’re a combination of the two, and highly focused on service. We’re not a low cost provider, but we give competitive pricing. We’re not a tech innovator, however, we do have cutting-edge technology. We consider ourselves a relationship-based, asset-based 3PL, targeting customers who are willing to spend a little more on service because that’s our focus. And our technology is as good as, if not better than, everyone else’s in our sector. BVM: What is your marketing strategy? Reed: “It’s a focus on brand integrity and having the entire organization aligned with our principles and values – how we do business, how we go to market, how we represent ourselves in front of our customers, our carrier partners, and our vendors. We want to do things one way. And that’s the ReedTMS brand. BVM: Is it challenging to retain drivers and skilled labor? BVM: What are the most important points you’d like to share about ReedTMS Logistics? Check out this handpicked feature on SiteWise, LLC – A leader in utility infrastructure. October 23, 2018 – ReedTMS Logistics was announced as a prestigious winner in the Recruiting category of the 2018 Optimas Awards by Workforce Magazine, a Human Capital Media publication. The awards program, celebrating its 28th year, recognizes companies achieving successful measurable business outcomes through visionary and impactful human resources initiatives. Altogether, more than one hundred companies applied for this year’s Optimas Awards.